Using supplemental funding from the American Recovery and Reinvestment Act of 2009 (ARRA), LOSH developed new worker training on health and safety hazards and benefits related to green buildings and green chemistry. The green building training enables workers to identify and respond to potential hazards in green construction and retrofit jobs. LOSH plans to carry out this training through building trades apprenticeship and pre-apprenticeship programs, local work source centers, and with workers in a variety of industries who handle chemicals as part of their jobs. LOSH collaborated on this project with partners at the UC Berkeley Labor Occupational Health Program (LOHP) and the University of Washington’s Northwest Center for Occupational Health and Safety to develop these new green curricula and carry out training throughout the West Coast. LOSH will soon introduce an innovative Green Building eTool to assist construction industry employers, employees, and consumers interested in saving energy through green building design. 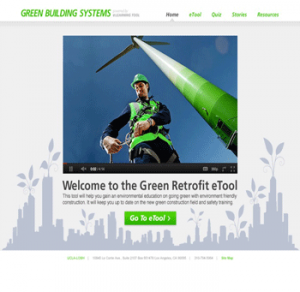 Offered free online, the educational tool highlights the latest methods available to introduce green building systems during construction. These green building methods offer many benefits to human health and the environment, but they may also present unique hazards to workers. The tool details these potential hazards to educate workers who may be exposed to green building materials during construction. Finally, the new tool reveals how green building systems can create new jobs in the economy. In 2009, the Los Angeles City Council passed a groundbreaking green building retrofit Ordinance and established a workforce development program. Led by LOSH with the UCLA Labor Center, the 2009 Community Scholars program brought together graduate students, labor and community leaders to create recommendations to implement the Ordinance. 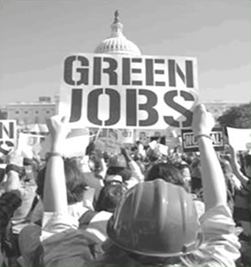 In collaboration with the Institute for Research on Labor and Employment, a research and policy brief – Good, Green, Safe Jobs: The Los Angeles Green Retrofit and Workforce Program – was developed. LOSH worked with the LA Apollo Alliance to focus on three areas of sustainability – the environment, health, and the economy – with the goal of revitalizing LA’s underserved communities. On August 5, 2009, approximately 100 people attended a one-day conference focusing on L.A.’s Green Retrofit and Workforce Development Program at the UCLA Downtown Labor Center. Discussion at “Working in Unity, Greening Our Communities” centered on the goals of the Green Retrofit Ordinance in the context of the current sociopolitical and economic environment, and challenges and opportunities involved in moving the ordinance forward, including creating safe and healthy green jobs. Students from the 2009 UCLA Community Scholars class (Green Collar Jobs, Green Buildings & Social Justice: Pathway to a Sustainable City) presented a preliminary report entitled “Roadmap to Retrofits” that described the origins of the ordinance and giving detailed analysis regarding next steps. The report explored ways to effectively implement the Ordinance to enhance the environment, support community economic development, and promote the health and wellbeing of workers and building users.